Congrats to our giveaway winner- Elizabeth Middleton! I am emailing you right now! This post is sponsored by BabbaCo by Jessica Kim! We are very excited to be teaming up with BabbaCo to share a monthly summer series with you where we will feature book-related crafts and activities created exclusively to go along with the children's book included in each BabbaBox. You can read our June post here. The July BabbaBox (that recently arrived on our doorstep) includes the children's book Sneakers the Seaside Cat by Margaret Wise Brown along with several seashore themed activities. Here is a sneak peak of of my kids doing a few of the projects that were included in this month's BabbaBox. The box contained a shell sorting activity, super cool sea turtle race game for us to make and play, a seashell picture frame craft, a picture book, a message in a bottle activity to send in the mail (my son's absolute favorite), and some seashore coloring activities. Sneakers the Seaside Cat by Margaret Wise Brown is a book about a sweet black-and-white cat who takes a trip to the seashore. The story describes his adventures as he explores the seashore. He discovers several animals and shells and enjoys the sensory experience of his trip to the ocean. We loved the pictures in this book and my daughter loved the kitty cat. She said, "meow!" the entire time we were reading. After reading this book a few times, we were inspired to create our own sticky wall seashore and make a seashore snack! My kids have been loving rocks, shells, and stickiness lately, so I knew it was time to get some contact paper up on the walls and start creating!! We were originally introduced to the concept of sticky walls by our friend Allie at No Time for Flashcards and have been loving them ever since! The main tip I will give you for this project is to let go of what you think the end product should look like and embrace the vision your child has! Let them create and just have fun doing it with them! My seashore project would've looked very different from this one... but I think my son's project is BEAUTIFUL and he is so proud of it! Stick contact paper on your wall with the sticky side out and tape it in place using painters tape. 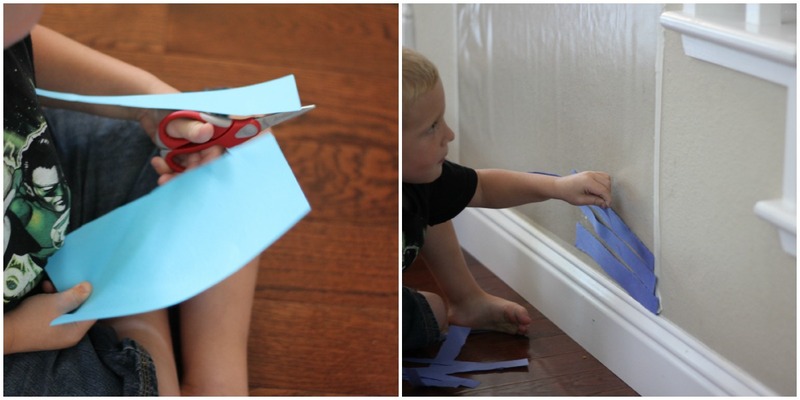 Snip or rip colored paper and start creating your ocean and sand by sticking the paper onto your sticky wall. Take rectangle strips of paper and tape them into small rolls. Snip the edges of of the rolls. Fluff out the little strips to make them seem like their tentacles are waving/moving. Stick paper circles onto contact paper. Attach flat toothpicks to the contact paper around the edges of the circles. Place a piece of contact paper over the toothpicks/paper to secure everything into place. 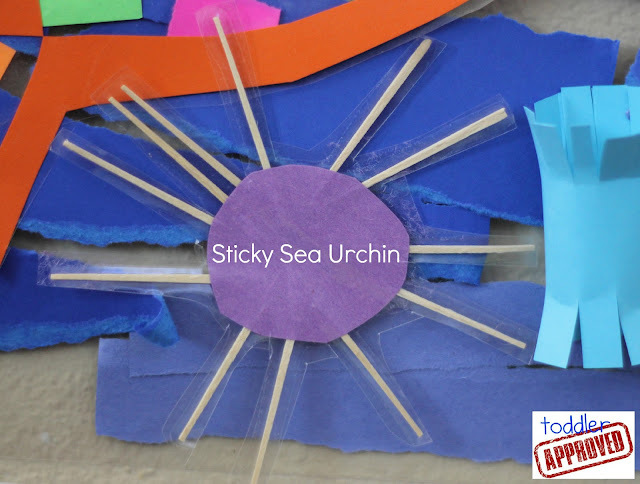 Trim around the edges of the toothpicks and then add the urchin to your sticky wall! Hunt for rocks and gather shells from around your house (several shells came in our BabbaBox that were perfect to use). Stick them on the sticky wall. If they are too heavy, use some tape. My son loved going on a rock hunt outside to find little pebbles for us to use. Color pictures of other sea shells, cut them out, and stick them on the wall. As you can see, this activity kept us busy and creating for quite awhile! The thing I love about sticky wall collages is that they don't have to be done all at one time. They can be done over the course of a day... or two or three. The collage can be an ongoing creative project and is perfect for siblings to work on together. You can put them anywhere- on a screen glass door, a wall, an easel, or even on a kitchen cupboard. After all of our hard work, we were ready for a seashore snack! There was a sailboat in the background of most of the illustrations in the book. 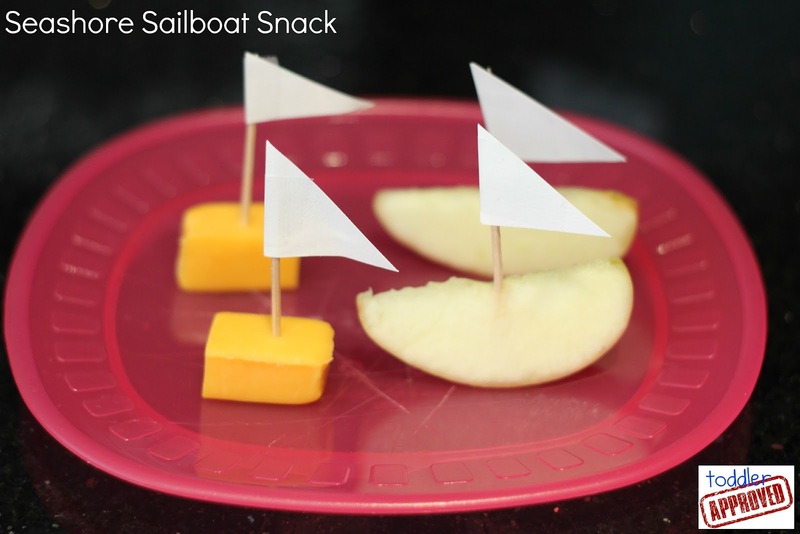 Since my kids are picky eaters, I always love making healthy food a little more fun. These sailboats snacks are a simple way to do that. Do you have any other favorite seashore crafts, activities, or crafts? Have you signed up for a monthly BabbaBox subscription yet? If not, today is your lucky day! BabbaCo is GIVING AWAY a 3-month BabbaBox membership to one of our Toddler Approved readers! Check out this post to find out what you get in each BabbaBox and why we are so excited about it. 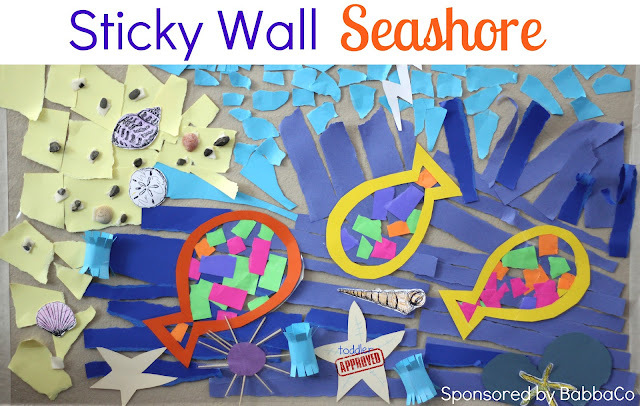 - Share one link to a favorite seashore themed craft or activity! - This giveaway is open for entry from Tuesday, July 30th to Tuesday, August 7th at 11:59pm (PST). - The random entry will be drawn on August 8th and announced on this post. I will notify the winner via email. - See our Official Giveaway Rules for complete guidelines. This promotion is in no way sponsored, endorsed, or administered by, or associated with Facebook. You are providing your information to Toddler Approved and not to Facebook. The information you provide will only be used for Toddler Approved. Disclosure: This is a sponsored post on behalf of BabbaCo. BabbaCo will be compensating me for my monthly book-related craft and activity posts. All posts reflect my personal opinion and endorsement and are not swayed by compensation and/or free products. Please note that this post reflects my opinion and preferences and you might not share that same opinion. I'm sharing a link for some seashore/beach themed crafts! If you scroll a little ways down, my favorite (reason why I'm linking this) is the seashell critters :) I think they are so super cute and that any child would absolutely love them! I am so sorry! I forgot to add a link with my original post. What a great idea and time saver! This looks like so much fun. My son would have a blast doing these activities. I subscribe to the Toddler Approved Monthly Newsletter! Wow, those look great! Please count us in! Sweet looking stuff in the box, but you round it out with your additions to the theme and enthusiasm. Thanks! Awesome giveaway. Don't have the $$ to try it out, so this would be great. Awesome giveaway. Been wanting to try but put off by cost. I subscribe to the Toddler Approved Newsletter! What great ideas. I already follow you on facebook and have your newsletter emailed to me. cool! kimchristenson at gmail dot com. That is such a cool idea! Thanks for sharing at tip toe thru tuesday! These look fabulous...perfect for escaping the summer heat! These look like so much fun ! We'd love to try this! Thanks so much! How exciting! 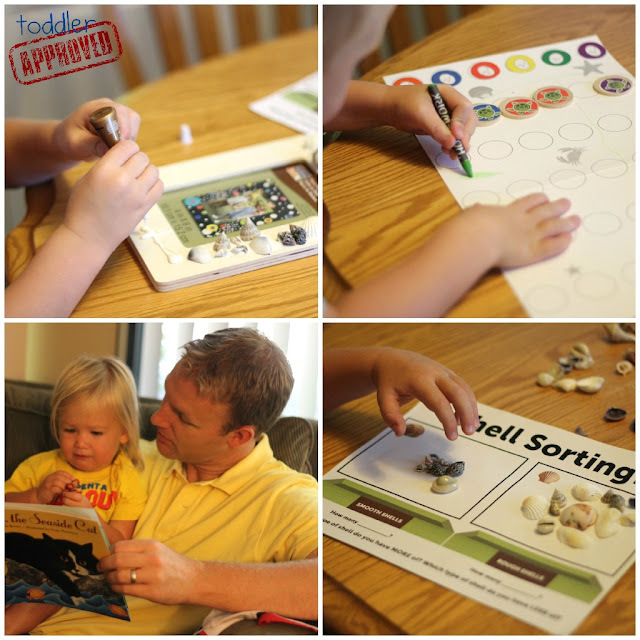 Following Toddler Approved on Facebook and Pinterest! Subscribed to Toddler Approved Newsletter. Facebook Follower and I love it. Such a simple activity but it turns out so cute. We gave these a Christmas gift for the grandparents. Wow this would be so cool to try out with my daughter. I love crafts and I want her to also. I am really excited to try BabbaBox! I'm really excited to try BabbaBox! I follow Toddler Approve on facebook. I subscribe to your monthly newsletter. Awesome giveaway! Thanks for the chance!!! I follow BabbaCo on Facebook and Twitter! I subscribe and LOVE your monthly newsletter!!! I follow you on Twitter, Facebook, and Pinterest! Looking forward to putting BabbaBox on the Christmas wish list for the kids. Here's a link to a fun jellyfish craft for little ones. My son just turned TWO yesterday and don't know a better present than receiving a 3-month Babbaco subscription for a crafty mom and curious son to enjoy! Fun times for all! LOVE Babba Box! Patiently waiting for my son's first shipment to come in the next few weeks!! I follow Toddler Approved on Facebook! I follow Toddler Approved on Pinterest! I follow Babba Box on Facebook! I follow Babba Co on Twitter! I follow Toddler Approved on Twitter! I receive the Toddler Approved newsletter! My 2 year old daughter would love this! oops, I follow Toddler Approved on FB! THis would be a tremendous addition to our homeschool! Wow!! My email is laurabush2005@hotmail.com. I think these would be cool to try with my toddler. I just subscribed to your monthly newsletter. Am loving that sticky wall..... I'm going to have to do that tomorrow! I follow you on Pinterest and FB! I love your craft! The sea urchin is such fun!